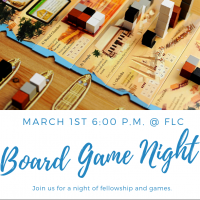 Board Game Night on Friday, March 1 at 6:00 p.m. in the Family Life Center. Bring snacks to share. Childcare will be provided for a free will donation to the high school students attending the LIFE conference this summer. Contact Pastor Stephen for more details!